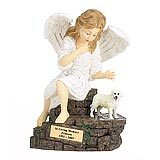 "The urn arrived safely and is just beautiful. The condolence card was a lovely touch as well. I've been told in time this will bring me comfort but unfortunately not at this time. The wounds are too raw. I miss my beautiful friend more than I can say. Thank you for your kindness." 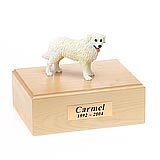 All available Kuvaszok dog urns and memorials will be displayed with the figurine on the Kuvaszok urn you select and in the appropriate size.